SOLAS CSCS Mobile Access Towers course is suitable for candidates working in the Republic of Ireland. Mobile Access Towers training is available on-site on your premises anywhere in the Republic of Ireland subject to minimum numbers. A suitable room would be required for on-site training for the theory section of the course, and mobile access towers are needed for the practical. The manufacturer’s instruction manual must be available for the training. The Mobile Access Tower courses are available at our Training Centre in Ashbourne, Co. Meath subject to minimum numbers. 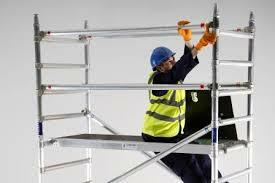 On successful completion candidates will be issued a SOLAS CSCS Mobile Access Towers card and certificate. Trainees must have the appropriate Personal Protective Equipment with them i.e. Helmet, Safety Boots, Hi-Viz Vest. This Mobile Access Tower training course is suitable for anyone who wishes to learn how to erect, dismantle, and inspect Aluminium Scaffold Towers. To provide delegates with the essential knowledge required to use, inspect and store Aluminium Scaffold Towers efficiently and safely. All those in your organisation who use, supervise or manage the use of Mobile Access Towers.